functionality, low viscosity, good compatibility with the usual radiation curable ... viscosity of the radiation-curable formulations significantly.3 ... toluene failed. 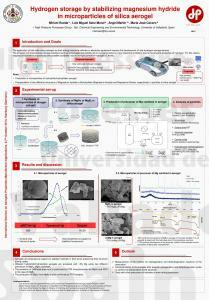 SiO2 aerogel film as a novel intermetal dielectric. Moon-Ho Jo, Hyung-Ho Park,a) Dong-Joon Kim, Sang-Hoon Hyun, Se-Young Choi, and Jong-Tae Paikb). 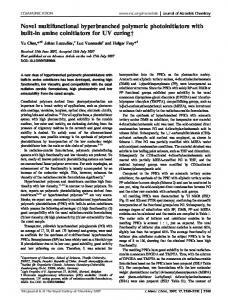 Nanomedicine (2010) 5(2), 169â171. 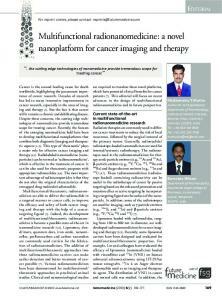 â...the cutting edge technologies of nanomedicine provide tremendous scope for treafing cancer.â Madaswamy S Muthu. 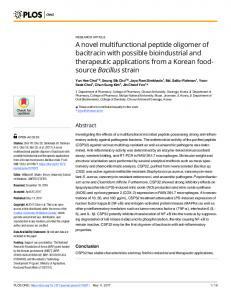 Mar 25, 2016 - School of Life Science, Anhui Agricultural University, Hefei 230036, ... of a kaempferol backbone (A, B, and C rings) with a p-coumaroyl (p-. Oct 25, 2010 - Roos DS, Donald RG, Morrissette NS, Moulton AL: Molecular tools for ... Lal K, Sinden RE, Brunk BP, et al: The proteome of Toxoplasma gondii:. Jun 26, 2018 - Exfoliated Polymer-Clay Nanocomposites through .... aerogel masterbatches to prepare polystyrene- (PS-) clay ...... eat flow (mW) Endo. Exo. Dec 15, 2011 - ... Development Department, Panasonic Electric Works Co.,Ltd., Kadoma, Japan ... nization (KEK), Chiba University, and Panasonic (Mat-. Abstract: Optical transmission measurements were made on 98% porosity silica aerogel samples under various degrees of uniaxial strain. Uniaxially. Hydrogen storage by stabilizing magnesium hydride in microparticles of silica aerogel. 4. Introduction and Goals. 1. Results and discussion. Conclusions. 4. 3.1.
of Bioengineering, College of Engineering and Applied Science, University of Colorado Denver | Anschutz Medical. Campus ... systems, and robust electromechanical systems to recre- ate what was lost. ...... Clinically oriented anatomy. 4th ed. Journal of Open Access Article. Published on 12 June 2018. Downloaded on 6/18/2018 2:51:49 PM. This article is licensed under a Creative Commons Attribution-NonCommercial 3.0 Unported Licence. organic pollutants (absorption capacities 500–2600 g g1 %) from water and acted as a highperformance ﬁlter for continuous water/oil separation. Moreover, they have demonstrated impressive thermal insulation performance (l ¼ 0.032–0.044 W m1 K1) with excellent ﬁre retardancy and selfextinguishing capabilities. Therefore, the PMSQ–SF aerogel hybrids would be a new class of open porous material and are expected to further extend the practical applications of this class of porous compounds. Open Access Article. Published on 12 June 2018. Downloaded on 6/18/2018 2:51:49 PM. This article is licensed under a Creative Commons Attribution-NonCommercial 3.0 Unported Licence. 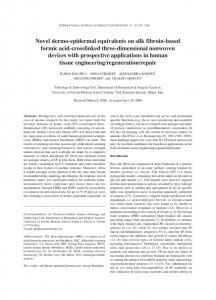 readily change the network build-up and subsequently the structural properties, such as macroporosity and the bulk mechanical strength; (3) one-pot sol–gel chemistry requires careful control of the kinetics of the gelation processes of the two diﬀerent components (SF and PMSQ); and (4) only a thorough structural investigation will give detailed information about the homogeneity of the nal hybrid gel network and deeper insights into synthesis–structure–property relationships. In brief, a combination of superhydrophobic PMSQ aerogel with SF biopolymer oﬀers a straightforward approach to providing a 3D open cellular hybrid structure with tunable surface wettability and mechanical properties for versatile applications. Synthesis of PMSQ–SF hybrid aerogels. hybrid series, the following sample labeling is used: PMSQ aerogels that are directly mixed with SF without coupling agent are labeled as EM-SF-x, where x represents the SF mass fraction with respect to the silicon. Those composites that are prepared in the presence of the coupling agent, TMSPA, are labeled as EMT-y-SF-x, where y represents the Si mol% of TMSPA with respect to the total number of silicon centers. With these values, a broad range of PMSQ and SF contents are addressed. For both aerogel hybrid series, we adopted a one-pot twostep acid–base sol–gel approach (Scheme 1) in which a sol of organosilanes (MTMS and TMSPA (0–20 mol% of total silicon)) and SF was prepared in an aqueous acetic acid solvent (1.17 mM) in the presence of hexadecyltrimethylammonium bromide (CTAB, 0.5 g). The SF mass fraction was adjusted with respect to the total amount of silicon so that the SF : Si mass ratio for [Si]3.5 was 15 : 100, 40 : 100 and for [Si]17.5 was 1 : 100, 4 : 100, respectively. SF gelation occurs concurrent with an increase in sol viscosity (in 10 min) and only in the second step aer slow addition of NH4OH (1 mL, 2.8 wt% for EM (without TMSPA) and (1 mL, 28–30 wt% for EMT (with TMSPA)) polycondensation and gelation of the hydrolyzed organosilane species starts. The hybrid PMSQ–SF gels were aged in an oven (40  C, 2 d). Byproducts were extracted by solvent exchange with methanol, followed by drying of the ligree wet gels by extraction with supercritical CO2 (Tc ¼ 45  C, Pc ¼ 95 bar). For aerogel panels, the sol was cast in a medium sized Petri dish, and all other processing steps were the same as for cylindrical monoliths. H–29Si heteronuclear correlation MAS NMR spectroscopy of (a) EM-SF-15, (b) EMT-10-SF-15. a Specic surface area (SBET). diameter (Dpore, eqn (S3)). Pore volume (Vpore, eqn (S2)). Fig. 5 (a) Stress–strain curves of PMSQ–SF monoliths for [Si]3.5 with the compressive behaviour, (b) the stress–strain curves for [Si]3.5 in a low strain, (c) the variation of Young' modulus (E), bulk density (rb), maximum strain 3 (%), and max. compressive strength (dmax) versus SF and TMSPA content for [Si]3.5 series of PMSQ–SF monoliths, (d) the compressive hysteresis of EMT-10-SF-40 at maximum strain of 50% in two successive compressive cycles, (e) the compressive hysteresis of EMT-10-SF-4 at maximum strain of 60% in ﬁve cycles, (f) stress–strain curves of PMSQ–SF monoliths for [Si]17.5, (g) the variation in the maximum strength of representative developed hybrid aerogels. (a) Superhydrophobic behaviour in both EM-SF-4 and EM-SF40 aerogels, (b) and (c) show the surface wettability of the EMT-10-SF4 and EMT-10-SF-40, respectively, with water, vegetable oil, methanol and acetone and the respective water contact angles, (d) photographs show the selective absorption of vegetable oil by the EM-SF-40 aerogel due to its superhydrophobicity and superoleophilicity. Note: the Petri dish is oleophilic. methanol and acetone in ve absorption cycles. In this regard, the removal of the chosen solvents from the corresponding PMSQ–SF aerogels between the cycles only required a gentle compression and drying for 0.5 hours with a very low degree of aerogel network disintegration aer the 5th cycle (Fig. 7(c)). Although due to the higher porosity and lower density in EMSF-40 and EMT-10-SF-40, a higher initial absorption capacity compared to those of EM-SF-4 and EMT-10-SF-4 is obtained, while the latter aerogels indicated a small compromise in the absorption capacity during the next absorption cycles. This is because these aerogels show a minimal shrinkage upon drying from the solvent of the rst cycle and therefore the porosity and the absorption capacity subsequently were reduced in the initial cycles and then became constant. The absorption capacities and weight aer drying between the cycles for EM-SF-4 and EMT-10-SF-4 for both methanol and acetone during all absorption cycles remained almost constant. Fig. 8 Experimental data ﬁtted with the pseudo-ﬁrst and -second order models for the absorption kinetics of vegetable oil onto the PMSQ–SF aerogels at 23  C.
Fig. 9 (a) Gravity-driven separation of vegetable oil from water, (b) continuous separation of water from oil using a simple device. The continuous collection of (MB dyed) water (12 mL) from oil (3 mL) with a piece of EM-SF-40 aerogel (1 cm  1 cm) (vd. Movie S2†). Fig. 10 (a) Thermal conductivity of some representative PMSQ–SF aerogel hybrids, (b) EM-SF-40 after immersing in the LN2, (c) burning behavior of the EM-SF-40 with time. temperature, liquid nitrogen (LN2), and elevated temperature (100  C). As is seen from the Table S1,† when EM-SF-40 was immersed in the LN2 (vd. Fig. 10(b)) for 1 minute and then exposed to 100  C in an oven for 1 hour, minor compromise with regard to the sample mass and compressive strength could occur. Thus, this behavior would qualify the PMSQ–SF aerogel for application in the rigorous environments such as thermally insulating materials required for space exploration. Traditional fossil-fuel insulating materials are easily ignitable and therefore require the addition of ame retardants.74,75 Most of the ame-retardant materials, like halogenated and phosphorous compounds, have a negative impact on health and the environment.76 The silica and PMSQ aerogels are known as re retardant materials.75,77 Another advantage of PMSQ–SF aerogel hybrids is their re-retardant behavior due to the homogenous mixing of silk broin biopolymer and the PMSQ network in overall aerogel composite. Fig. 10(c) demonstrates the vertical burning of PMSQ–SF aerogel (EM-SF-40) which displayed excellent re retardancy without self-propagation of the ame, and resulted in a carbonized residue with almost similar shape and dimension as the original aerogel. The pure silk broin aerogel displayed low re retardancy and shrunk upon burning (vd. Fig. S11†). able to interact with a protein-based polymer of SF and thus allowing for mixing the superhydrophobic silsesquioxane network with the hydrophilic biopolymer phase. In this regard, homogeneous mixing of the two phases at the molecular level has been obtained through carefully controlling the gelation behavior of the diﬀerent components. It has been shown that the addition of the coupling agent to the methyltrimethoxysilane sol–gel mixture results in distinct changes in the network build-up. Substantial changes in the porous structure are also obtained when the SF phase is mixed in. To get a high level of control on the homogeneity, the sol–gel reaction was pursued in a two-step approach, in which rst, the SF protein was gelled and only in a second step, by changing the pH value, the silane network was condensed. 1H–29Si heteronuclear correlation NMR spectroscopy in combination with detailed compositional studies by various other techniques conrmed a successful homogeneous linkage/mixing of SF to PMSQ at the molecular level. The hierarchically organized, porous PMSQ–SF aerogels show a very low density of 0.08–0.15 g cm3 in addition to a high compressive strength up to 14 MPa and compressibility up to 80% strain along with excellent bending exibility and viscoelasticity in diﬀerent compressive cycles. Meanwhile, the representative PMSQ–SF hybrid aerogels demonstrate superhydrophobicity/oleophilicity (q > 150 for water) which provide them with excellent organic pollutants/oil separation from water with remarkable absorption capacities (500–2644% weight gain), recyclability for some solvents as well as continuous separation of contaminants from water. It is worth noting that the PMSQ–SF aerogel hybrids also display very good thermal insulation performance (l ¼ 0.032 to 0.043 W m1 K1), re retardancy and stability in the rigorous environment. Together with the excellent processability, these unique multifunctional gels are expected to further extend the practical applications of this class of porous compounds. To this end, the high performance multifunctional hybrid PMSQ–SF hybrid aerogels of this study interestingly can be prepared in such a way to utilize the silk broin cocoon of the textile industry's biomass or waste, and therefore it would be a great attempt toward the mass reduction and greener environment with less carbon footprint. Conﬂicts of interest Open Access Article. Published on 12 June 2018. Downloaded on 6/18/2018 2:51:49 PM. This article is licensed under a Creative Commons Attribution-NonCommercial 3.0 Unported Licence. There are no conicts to declare. Acknowledgements Hajar Maleki acknowledges nancial support by the Austrian FWF for the Lise Meitner fellowship (project number: M2086N34). Transmission electron microscopy, TEM, was carried out using facilities at the University Service Centre for Transmission Electron Microscopy, Vienna University of Technology, Austria. Lawrence Whitmore acknowledges nancial support ¨ from Interreg Osterreich-Bayern 2014–2010 Project AB29 Synthese, Charakterisierung und technologische Fertigungsans¨ atze f¨ ur den Leichtbau “n2m” (nano-to-macro). We gratefully acknowledge the help of Karin Whitmore in the preparation of ultramicrotome specimens. References 1 S. S. Kistler, Nature, 1931, 127, 741. 2 N. H¨ using and U. Schubert, Angew. Chem., Int. Ed., 1998, 37, 22–45. 3 M. M. Koebel, A. Rigacci and P. Achard, in Aerogels Handbook, ed. M. A. Aegerter, N. Leventis and M. M. Koebel, 2011, pp. 607–633. 4 J. P. Randall, M. A. B. Meador and S. C. Jana, ACS Appl. Mater. Interfaces, 2011, 3, 613–626. 5 G. Zu, T. Shimizu, K. Kanamori, Y. Zhu, A. Maeno, H. Kaji, J. Shen and K. Nakanishi, ACS Nano, 2018, 12, 521–532. 6 H. Maleki and N. H¨ using, Appl. Catal., B, 2018, 221, 530–555. 7 H. Maleki, Chem. Eng. J., 2016, 300, 98–118. 8 J. E. Amonette and J. Maty´ aˇs, Microporous Mesoporous Mater., 2017, 250, 100–119. 9 Z. Wu, L. Zhang, J. Li, X. Zhao and C. Yang, RSC Adv., 2018, 8, 5695–5701. 10 H. Maleki, L. Dur˜ aes, C. A. Garc´ıa-Gonz´ alez, P. del Gaudio, A. Portugal and M. Mahmoudi, Adv. Colloid Interface Sci., 2016, 236, 1–27. 11 J. Stergar and U. Maver, J. Sol-Gel Sci. Technol., 2016, 77, 738– 752. 12 A. C. Pierre and G. M. Pajonk, Chem. Rev., 2002, 102, 4243– 4265. 13 Y. Zhang, J. Wang and X. Zhang, J. Colloid Interface Sci., 2018, 515, 1–9. 14 J. Wang, Y. Zhang, Y. Wei and X. Zhang, Microporous Mesoporous Mater., 2015, 218, 192–198. 15 J. Wang, Y. Zhang and X. Zhang, J. Mater. Chem. A, 2016, 4, 11408–11415. 16 H. Maleki, L. Dur˜ aes and A. Portugal, J. Non-Cryst. Solids, 2014, 385, 55–74. 17 A. Soleimani Dorcheh and M. H. Abbasi, J. Mater. Process. Technol., 2008, 199, 10–26. 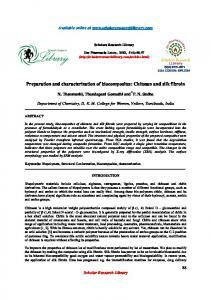 18 A. Venkateswar, R. Sharad, D. Bhagat, H. Hirashima and G. M. Pajonk, J. Colloid. Interface Sci., 2006, 300, 279–285. 19 K. Kanamori, M. Aizawa, K. Nakanishi and T. Hanada, Adv. Mater., 2007, 19, 1589–1593. 20 G. Hayase, K. Kanamori, M. Fukuchi, H. Kaji and K. Nakanishi, Angew. Chem., Int. Ed., 2013, 52, 1986–1989. 21 G. Hayase, K. Kanamori and K. Nakanishi, J. Mater. Chem., 2011, 21, 17077–17079. 22 N. Leventis, Acc. Chem. Res., 2007, 40, 874–884. 23 N. Leventis, C. Sotiriou-Leventis, G. Zhang and A.-M. M. Rawashdeh, Nano Lett., 2002, 2, 957–960. 24 J. Wang, J. Kuhn and X. Lu, J. Non-Cryst. Solids, 1995, 186, 296–300. 25 A. Karout, P. Buisson, A. Perrard and A. C. Pierre, J. Sol-Gel Sci. Technol., 2005, 36, 163–171. 26 M. A. B. Meador, S. L. Vivod, L. McCorkle, D. Quade, R. M. Sullivan, L. J. Ghosn, N. Clark and L. A. Capadona, J. Mater. Chem., 2008, 18, 1843–1852. 27 C.-Y. Kim, J.-K. Lee and B.-I. Kim, Colloids Surf., A, 2008, 313– 314, 179–182. 28 J. Cai, S. Liu, J. Feng, S. Kimura, M. Wada, S. Kuga and L. Zhang, Angew. Chem., Int. Ed., 2012, 51, 2076–2079. 29 S. Zhao, Z. Zhang, G. Sebe, R. Wu, R. V. Rivera Virtudazo, P. Tingaut and M. M. Koebel, Adv. Funct. Mater., 2015, 25, 2326–2334. 30 A. Demilecamps, G. Reichenauer, A. Rigacci and T. Budtova, Cellulose, 2014, 21, 2625–2636. 31 S. Zhao, W. Malfait, A. Demilecamps, Y. Zhang, S. Brunner, L. Huber, P. Tingaut, A. Rigacci, T. Budtova and M. M. Koebel, Angew. Chem., Int. Ed. Engl., 2015, 54, 14282–14286. 32 S. Takeshita and S. Yoda, Nanoscale, 2017, 9, 12311–12315. 33 S. Zhao, W. J. Malfait, E. Jeong, B. Fischer, Y. Zhang, H. Xu, E. Angelica, J. W. M. Risen, J. W. Suggs and M. M. Koebel, ACS Sustainable Chem. Eng., 2016, 4, 5674–5683. 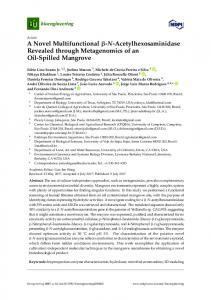 34 S. Zhao, W. J. Malfait, N. Guerrero-Alburquerque, M. M. Koebel and G. Nystr¨ om, Angew. Chem., Int. Ed., 2018, DOI: 10.1002/ange.201709014. 35 G. Hayase, K. Kanamori, K. Abe, H. Yano, A. Maeno, H. Kaji and K. Nakanishi, ACS Appl. Mater. Interfaces, 2014, 6, 9466– 9471. 36 W. J. Malfait, S. Zhao, R. Verel, S. Iswar, D. Rentsch, R. Fener, Y. Zhang, B. Milow and M. M. Koebel, Chem. Mater., 2015, 27, 6737–6745. 37 D. N. Rockwood, R. C Preda, T. Y¨ ucel, X. Wang, M. L. Lovett and D. L. Kaplan, Nat. Protoc., 2011, 6, 1612–1631. 38 F. G. Omenetto and D. L. Kaplan, Science, 2010, 329, 528– 531. 39 R. R. Mallepally, M. A. Marin, V. Surampudi, B. Subia, R. R. Rao, S. C. Kundu and M. A. McHugh, Biomed. Mater., 2015, 10, 035002. 40 P. Tseng, B. Napier, S. Zhao, A. N. Mitropoulos, M. B. Applegate, B. Marelli, D. L. Kaplan and F. G. Omenetto, Nat. Nanotechnol., 2017, 12, 474–480. 41 A. Feinle, S. Flaig, M. Puchberger, U. Schubert and N. H¨ using, Chem. Commun., 2015, 51, 2339–2341. 42 A. R. Murphy and D. L. Kaplan, J. Mater. Chem., 2009, 19, 6443–6450. 43 C. R. Ehgartner, S. Grandl, A. Feinle and N. H¨ using, Dalton Trans., 2017, 46, 8809–8817. 44 S.-J. He, R. Valluzzi and S. P. Gido, Int. J. Biol. Macromol., 1999, 24, 187–195. 45 C. Z. Zhou, F. Confalonieri, M. Jacquet, R. Perasso, Z. G. Li and J. Janin, Proteins, 2001, 44, 119–122. 46 B. Wicklein, A. Kocjan, G. Salazar-Alvarez, F. Carosio, G. Camino, M. Antonietti and L. Bergstr¨ om, Nat. Nanotechnol., 2015, 10, 277–283. 47 A. Bang, C. Buback, C. Sotiriou-Leventis and N. Leventis, Chem. Mater., 2014, 26, 6979–6993. 48 Y. Duan, S. C. Jana, B. Lama and M. P. Espe, Langmuir, 2013, 29, 6156–6165. 49 R. W. Pekala, L. W. Hrubesh, T. M. Tillotson, C. T. Alviso, J. F. Poco and J. D. Lemay, presented in part at the Materials Research Society, MRS Symposium, Boston, 1990. 50 T. Woignier, J. Reynes, A. Hadi, A. Beurroies and J. Phalippou, J. Non-Cryst. Solids, 1998, 241, 45–52. 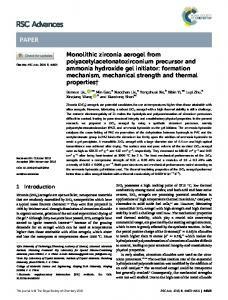 51 J. Fricke and A. Emmerling, J. Sol-Gel Sci. Technol., 1998, 13, 299–303. 52 Y. Pan, K. Shi, C. Peng, W. Wang, Z. Liu and X. Ji, ACS Appl. Mater. Interfaces, 2014, 6, 8651–8659. 53 F. Liu, M. Ma, D. Zang, Z. Gao and C. Wang, Carbohydr. Polym., 2014, 103, 480–487. 54 A. Mulyadi, Z. Zhang and Y. Deng, ACS Appl. Mater. Interfaces, 2016, 8, 2732–2740. 55 S. Han, Q. Sun, H. Zheng, J. Li and C. Jin, Carbohydr. Polym., 2016, 136, 95–100. 56 M. Shi, C. Tang, X. Yang, J. Zhou, F. Jia, Y. Han and Z. Li, RSC Adv., 2017, 7, 4039–4045. 57 Q. Liu, J. Chen, T. Mei, X. He, W. Zhong, K. Liu, W. Wang, Y. Wang, M. Liab and D. Wang, J. Mater. Chem. A, 2018, 6, 3692–3704. 58 Y. Zhan, J. Wang, K. Zhang, Y. Li, Y. Meng, N. Yan, W. Weia, F. Peng and H. Xia, Chem. Eng. J., 2018, 34, 184–193. 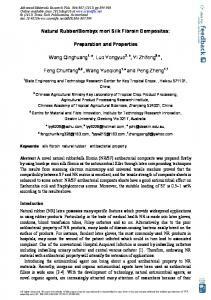 59 Y. H. Zhan, N. Yan, Y. C. Li, Y. Y. Meng, J. Wang, N. Zhang, Q. Yu and H. S. Xia, Chem. Eng. J., 2017, 327, 142–149. 60 Y.-Q. Li, Y. A. Samad, K. Polychronopoulou, S. M. Alhassan and K. Liao, ACS Sustainable Chem. Eng., 2014, 2, 1492–1497. 61 Y. Luo, S. Jiang, Q. Xiao, C. Chen and B. Li, Sci. Rep., 2017, 7, 7162. 62 J. Feng, S. T. Nguyen, Z. Fan and H. M. Duong, Chem. Eng. J., 2015, 270, 168–175. 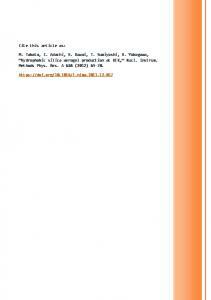 63 P. Sharma, B. K. Saikia and M. R. Das, Colloids Surf., A, 2014, 457, 125–133. 64 Y. Chen and D. Zhang, Chem. Eng. J., 2014, 254, 579–585. 65 Y. S. Ho and G. McKay, Process Biochem., 1999, 34, 451–465. 66 H. K. Boparai, M. Joseph and D. M. O'Carroll, J. Hazard. Mater., 2011, 186, 458–465. 67 L. Li, B. Li, H. Sun and J. Zhang, J. Mater. Chem. A, 2017, 5, 14858–14864. 68 Z. Shi, W. Zhang, F. Zhang, X. Liu, D. Wang, J. Jin and L. Jiang, Adv. Mater., 2013, 25, 2422–2427. 69 M. Huang, Y. Si, X. Tang, Z. Zhu, B. Ding, L. Liu, G. Zheng, W. Luo and J. Yu, J. Mater. Chem. A, 2013, 1, 14071–14074. 70 H. Maleki, L. Duraes and A. Portugal, J. Mater. Chem. A, 2015, 3, 1594–1600. 71 X. Wang, H. Zhang and S. C. Jana, J. Mater. Chem. A, 2013, 1, 13989–13999. 72 H. Maleki, S. Montes, N. Hayati-Roodbari, F. Putz and N. Huesing, ACS Appl. Mater. Interfaces, 2018, DOI: 10.1021/acsami.8b05856. 73 C. Rudaz, R. Courson, L. Bonnet, S. Calas-Etienne, H. Sallee and T. Budtova, Biomacromolecules, 2014, 15, 2188–2195. 74 T. Kashiwagi, F. Du, J. F. Douglas, K. I. Winey, R. H. Harris Jr and J. R. Shields, Nat. Mater., 2005, 4, 928–933. 75 T. Kashiwagi, J. W. Gilman, K. M. Butler, R. H. H. Jr, J. R. Shields and A. Asano, Fire Mater., 2000, 24, 277–289. 76 R. C. Hale, M. J. La Guardia, E. P. Harvey, M. O. Gaylor, T. M. Mainor and W. H. Duﬀ, Nature, 2001, 412, 140–141. 77 Z. Li, X. Cheng, L. Gong, Q. Liu and S. Lia, J. Non-Cryst. Solids, 2018, 481, 267–275. 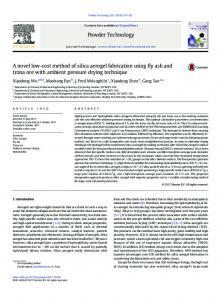 Report "Novel multifunctional polymethylsilsesquioxaneâsilk fibroin aerogel ..."